Hello dear friends and welcome newbies! I’m so glad you took time to stop by my little space on the web where I love to share my love of paper crafts. So what’s goin on today? It’s a I Love My Teacher Blog Hop hosted by Abby! This hop was a no-brainer for me. My daughter absolutely adores her teacher! She is the BEST and I’m so glad she gets to keep her for the fall, too. 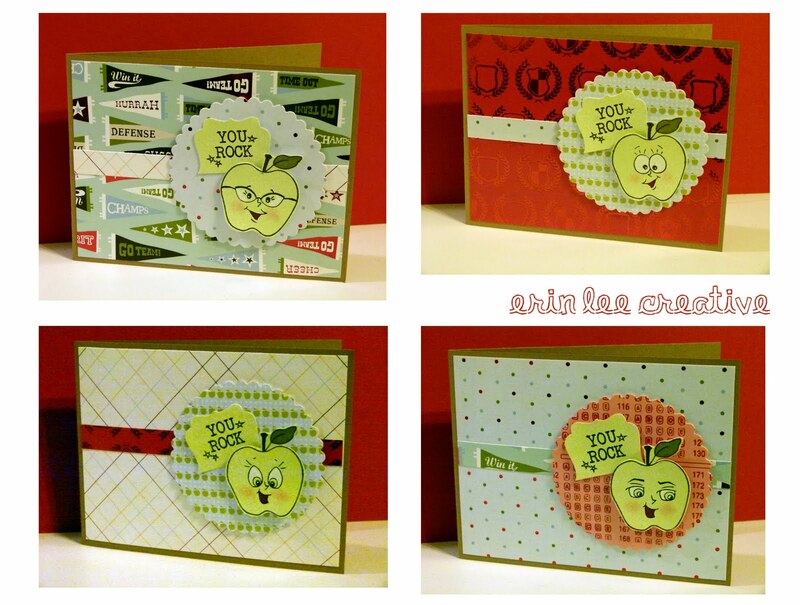 To start her off with the school year properly, I made her this card set. I didn’t take a picture, but I packaged them all up in a clear box with a note for her as well. I hope you enjoy my simple cards. I like to keep card sets simple since I’m creating multiples. For these cards, I used my Nestibilities, some patterned paper I had in my stash, my Unity Stamp Co Kit of the Month (You Rock stamp) and Peachy Keen Stamps Faceless Fruit paired with Retro Faces.